. . . See ALL of your Vorne XL devices on a single screen! A browser-based Intranet application that lets you see ALL of your Vorne XL Productivity Appliances™ on a single screen! Using both the XL Bolt-On Data Collector and direct access of your XL devices, we provide you with both up-to-date operational information as well as a historical perspective. 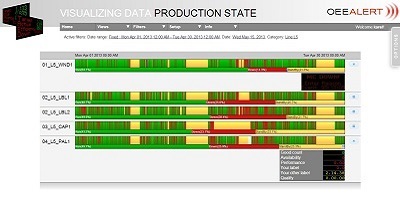 Real-time Instant Information Across the Plant! Many of you have asked to see your TPTs™ on one screen. Others have asked for Hour-by-Hour production control boards. You asked for Email/Message alerts as Down events are happening. You asked for the ability to enter comments. You asked for it!! We built it!! 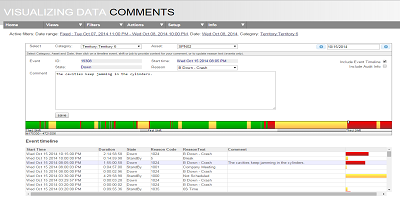 Ask us how we can help you get started with a 35-day free evaluation of OEE Alert. This evaluation uses your own data collected from up to 3 Vorne XL devices at your location. 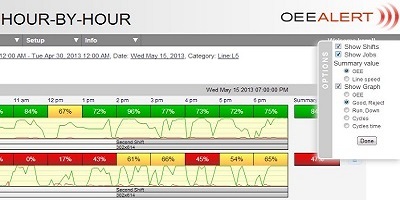 OEE Alert is a browser-based Intranet application that lets you see all of your Vorne XL Productivity devices on a single screen! Imagine this on a big-screen TV as you walk onto the plant floor or in the cafeteria! The impact and productivity improvement is immediate! Now you can view all of your Vorne XL TPT™ graphs on one screen. You also have the ability to customize the display for just the XL graphs you want to see - for example you might want to see all the devices on the Paint Line or all the devices in your Ft. Worth Plant. With simple drag-and-drop capabilities you can create as many display categories as you want. They can be created just for you or for everyone in the company. Additionally, a pop-up will display the current Down event next to the graph indicating the Reason Code and current duration. 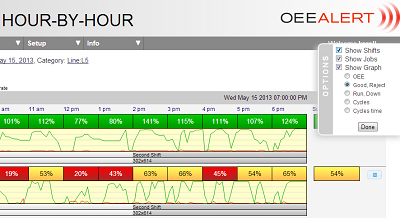 OEE Alert lets you evaluate the data that is collected by viewing each production event and changing the reason code if necessary. Comments can also be added (and viewed) to each event to provide more context as to what happened and why. Imagine providing your associates with the ability to identify and help address issues sooner rather than later. Whether it is changing an insert, loading material or something more complex, the associates want it addressed as soon as possible and now you can help. You can customize how many XL devices to display on the page - by Line, Department, Area, Type, etc. You can create many groupings of devices either for yourself or for the whole company. Do you use a whiteboard or spreadsheet for hourly production tracking? 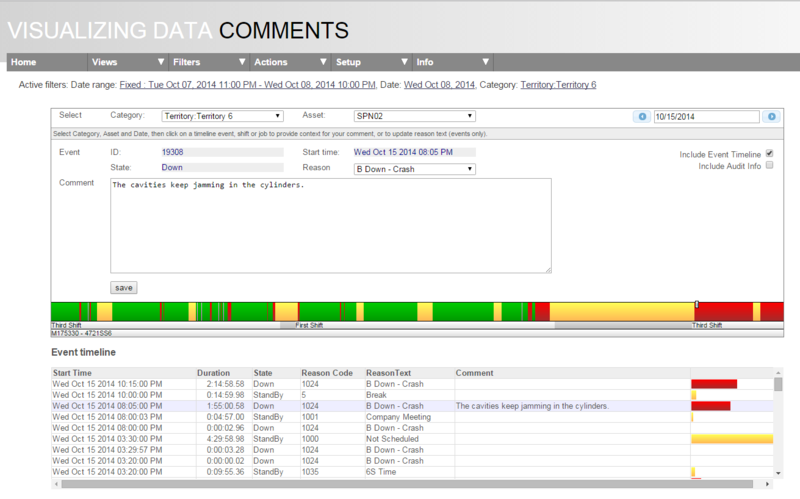 Let us help you to see your production as it's happening - reducing input errors and keeping your operators focused! 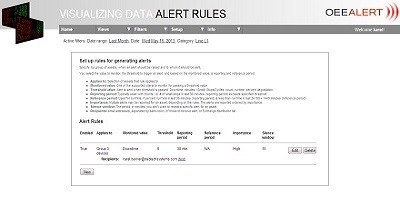 Set up rules for generating message alerts! Specify by group of assets, when an alert should be raised and to whom it should be sent. OEE & B.E.E.R. - find out how OEE and BEER work together! 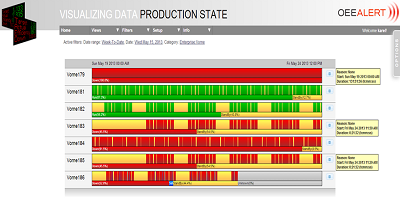 OEE Studio - Compare KPIs for different plants, lines, shifts or even products with one another - includes Downtime analysis and ad hoc reporting. Reporting Development & Integration - we can help you integrate your Vorne XL (or other) data with data from your existing data sources, such as SAP, MS SQL, Oracle, MS Access, MS Excel, etc. Designed by Deb-Tech Systems, Inc.